Our sew in days have been so full lately! It is exciting to see so many ladies working on so many different projects and to hear the laughter coming from the classroom. I've also heard quite a few good reports about our new From Marti and Me Club. The gals are having fun, they are learning new techniques and enjoying the new projects. Even I myself, am having a blast! So, Keep up with what is going on and come and join us for fun times! We have many fun classes coming up in the near future and we are already scheduling for after the new year at this time. I'm excited about all of the fun stuff coming up! Come in and check it out! Join Sue Walters and let her teach you the techniques to make this great wall hanging, just in time for the holidays. We still have a few spaces left for this class. Register today! This is the first class in a series of classes that Sue will be teaching out of the book Sew on the Go. Kit is $15.99 and you receive 20% off if you pick it up on November 19th. piecing with a fun pattern to get you started. This months project is the Seven Sisters Block. Easy and fun to make with no Y seams!!! 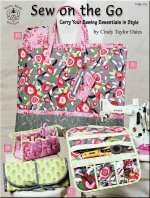 *** Members, don't forget to bring a block or project from a Marti Michell pattern or tool to be eligible to win a door prize! Join Tracy in making these adorable bowl fillers or add a ribbon and transform it into an ornament! Ever tried the Twister pattern? Like the look but hate the waste? Come and try this method, no waste and the tool is multi sized, so you can make 2"-9"! Two sizes available to see in samples in the shop. Use up those scraps or try a layer cake and a little bit of yardage to make a great lap quilt. 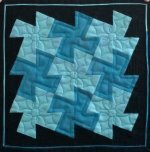 This "Sewcial" is for those of you who have participated in this past session of Beginner Quilting. Bring a dish to share and bring your project, finished or not. Show off the new skills that you have learned and socialize with other new quilters. Hoppin Bobbin will supply plates, napkins, cups, drinks and utensils. Pick up your pattern or your pre-ordered project kit. Get 20%off your kit, i you pick it up today! The holidays are quickly approaching. Hoppin Bobbin's cut off date to receive Quilts to be returned for Christmas, is November 1st. Please be sure to get your quilt in as soon as possible to avoid rush charges. Any quilts that are received after the cut off date (and need to be returned for Christmas) will incur a $50.00 Rush Charge through the end of November. Any quilts received in December that need to be returned for Christmas, will incur a $100.00 rush charge. There will be no exceptions to this rule. Please plan accordingly. We are also taking in Quilts, between now and Christmas, that are needed for after Christmas. If you need quilts done shortly after the new year, it is time to get them in. The "After Christmas" Quilting list, is already growing.